The island of San Giorgio Maggiore Venice with church and ride by elevator to the bell tower. San Giorgio Maggiore is a small island in the lagoon of Venice. It is only 200 meters away from the old town of Venice. Even closer is the larger neighbouring island Giudecca, the channel between the two islands is at its narrowest point only about 30 meters wide. But San Giorgio Maggiore is a real island without bridges to the neighbour. Large numbers of tourists come to the island. The most important sights are the church San Giorgio Maggiore and its bell tower. From the church tower you have a wonderful view to the most important sightseeings in Venice as the palace of the Doge's, the basilica of St. Mark and the famous tower of this church. As you can see in the picture above, San Giorgio Maggiore is a very small, rather round island. The area is only about 0.1 km² (10 hectares). On the island, next to the church, there is a former monastery that can only be visited on certain days with a guided tour (to the best of our knowledge, especially on weekends). During such a tour, one also sees the beautiful monastery gardens with the labyrinth garden "Labirinto Borgos" and the open-air theatre "Teatro Verde" in the style of ancient Greece. The great attractions of the island of San Giorgio Maggiore are the Church of San Giorgio Maggiore and the ascent of the bell tower. The church belongs to the top 5 churches in Venice and is definitely worth a visit. The basilica was designed by the very famous 16th century architect Andrea Palladio. The building plan was finished in 1566, already in 1575 it stood hull of the church. The completion of the Benedictine church around 1610 was no longer experienced by the architect Palladio, who died in 1580. 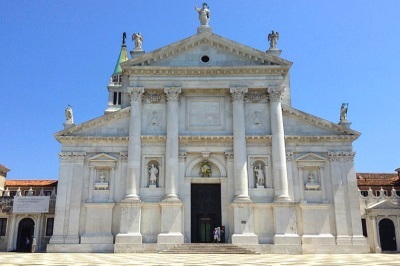 Typical for Palladio is the grandiose white front of the basilica in antique style. In the huge, very bright interior of the Chiesa San Giorgio Maggiore some paintings are world famous. Among them are the two large paintings "The Last Supper" and "The Fall of Manna" by Jacopo Tintoretto. Also the picture in the altar "Adoration of the shepherds" by Jacopo Bassano belongs to the very big paintings of Venice. We also liked the mighty pillars and round arches in the church very much. The second highlight of the island San Giorgio Maggiore for most visitors is the ride with the elevator to the much later built bell tower (Campanile). From above, one has a wonderful view to Venice, many think that it is the best panorama of Venice at all. The queues at the entrance of the bell tower are considerably shorter than the queues at the St Marks bell tower opposite the Basilica of St Mark, which also has an elevator. Both bell towers are built in a similar style. 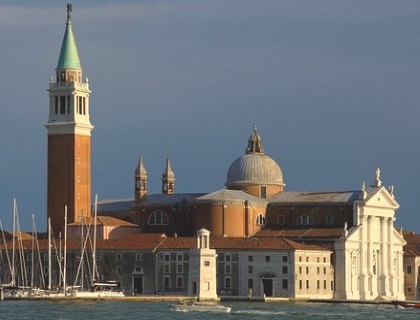 The ride with the lift to the tower of the church of San Giorgio Maggiore costs 6 euros admission for adults (in the beginning of 2019). The view to Venice from above is really breathtaking, for some even a highlight of the whole Venice trip. This alone makes a visit to the small island worthwhile. Great short video: One minute view from the bell tower to Venice. At about 20 to 30 seconds you can see the Doge's Palace and the Markusturm. The only way to get to the small island is by water bus, the public transport (ferries) from Venice. The only line that stops at the island is line 2, which runs very frequently, at least every 10 minutes during the day. In addition, the vaporetti (ships) of line 2 run in both directions. Be careful not to go in the wrong direction! From San Marco opposite (more precisely from the waterbus station San Marco Zaccaria) it is only 2-3 minutes by ferry to Giorgio Maggiore. From the other direction the waterbuses come from the neighbouring island Giudecca. Also from the big train station and many big sights in Venice you can take the line 2 directly to the island with the famous church. These include Venice Central Station, the bus station at Piazzale Roma and the world-famous Rialto Bridge over the Canal Grande.